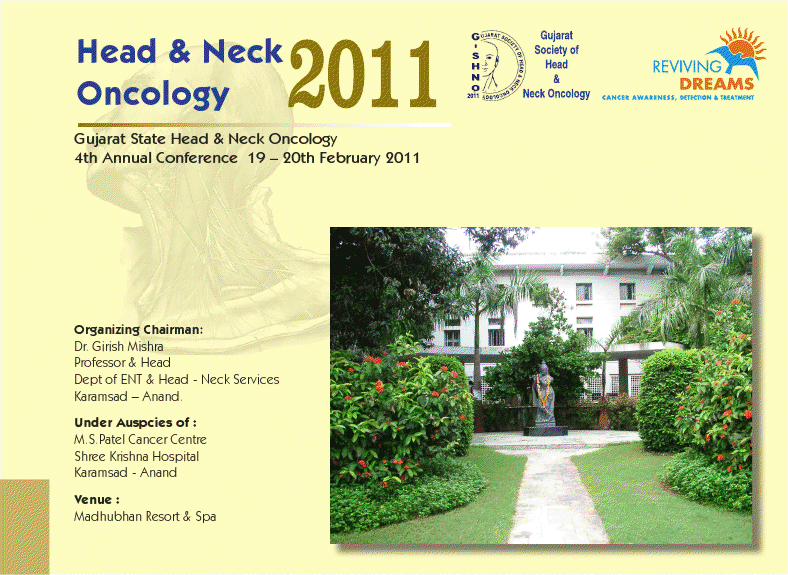 It gives me a great pleasure inviting you to the 4th Annual Conference of G-SHNO (Gujarat Society of Head and Neck Oncology) to be held on 19th and 20th Feb. 2011 at Anand, Gujarat. As many may be aware, Anand is considered to be the milk city of India, the home of Amul – “The Taste of India”. Also nearby is the birth place of our nation’s Iron Man Mr. Sardar Vallabh Bhai Patel - Karmasad. Karamsad holds the 1st private medical college of Gujarat. Attached are Shree Krishna Hospital, a 500 bedded multispecialty hospital and M.S.Patel Cancer Centre with state of art services. · High level of scientific feast with reputed national and international faculties. · More interactive sessions with enough opportunities to interact with the faculties. · Sessions will include invited and guest lectures, panel discussions, debates, poster presentations and surgical video presentation. · The conference will be preceded by a pre-conference CME on “Introduction to Head and Neck” for the upcoming head and neck surgeons and residents interested to peruse carrier in head and neck oncology. · Interesting video presentations with interactive session. · Special attraction for the spouses and children’s. Anand is cool and pleasant in February. The Resort is a perfect place to refresh oneself once again before scorching summer starts. We look forward for your active articipation in the milk city of India, Anand.